Update Wednesday 9:45 AM: City of Midland Spokesperson Sara Higgins has confirmed the sickened airline passenger transported to Midland Memorial Hospital (MMH) after landing in Midland does not have Ebola. “Ebola has been completely ruled out,” Higgins says, noting that Midland Memorial Hospital officials came to the conclusion after further medical testing, blood draws, throat swabs and other physical evaluations. The hospital says the passenger has not displayed a fever – one of the primary symptoms of the disease – and was not traveling to or from an “endemic” region. She was, however, traveling from Dallas, where the only person diagnosed with Ebola in the U.S. is still being treated. The passenger had reportedly been vomiting in flight. Due to the recent, widespread media coverage regarding the Ebola virus, the pilot alluded to the fact that several other passengers on board were concerned Ebola could be the cause. At that time, the City of Midland, Health Department and Fire Department Officials all responded…with full infectious disease precautions in place in the event the passengers’ concerns were valid. First responders initially determined it was “highly unlikely” the passenger had Ebola after a full medical evaluation on the scene at the airport. Still, as a “further precaution,” the hospital says she was admitted into an isolation room for further testing. No other passengers on the flight showed signs of being sick. After an Ebola scare Tuesday night at the Midland International Airport, a city spokesperson says it’s “highly unlikely” a sickened airline passenger has Ebola. “At this point we are considering it not to be Ebola but we never want to rule anything completely out. It’s highly unlikely that it is Ebola,” Bustilloz said. The passenger was reportedly traveling on an American Eagle flight from Dallas when the pilot called to alert local authorities that she was sick. That plane landed at the Midland International Air and Space Port (MAF) just after 11 p.m.
At some point in the flight, Ebola was mentioned. 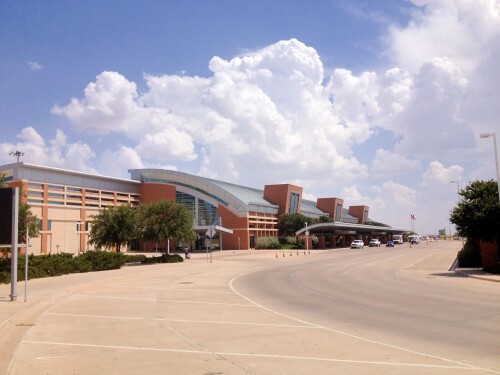 …Because of this, Midland Fire Department personnel who are stationed at the airport were ready when the flight landed and boarded the plane to assess the situation. The female passenger was vomiting but did not have a fever. She was also traveling from Istanbul, Turkey, which has not had any confirmed Ebola cases. This makes Ebola highly unlikely in this scenario, but authorities took infectious disease precautions in transporting the passenger to a local hospital to be treated and monitored. The city says local officials are staying in contact with the CDC and all passengers on the flight. Those passengers’ contact information was collected, and all passengers were instructed to notify health officials if they display any flu-like symptoms as a precaution. Governor Rick Perry on Monday announced the creation of an infectious disease task force to make sure Texas has a game plan for responding to Ebola or other infectious viruses. This entry was posted in KRTS News and tagged CDC, Disease, ebola, Ebola in Texas, Ebola Scare in Midland, Governor Rick Perry's Infectious Disease Task Force, healthcare, Midland International Air and Space Port, Midland International Airport. Bookmark the permalink.